When I told a loved one over skype that I was going to take my leave from the anime blogosphere on twitter, she immediately suggested that I say goodbye in some capacity, perhaps through a farewell post on what looks to be the remains of a blog that talks about anime. 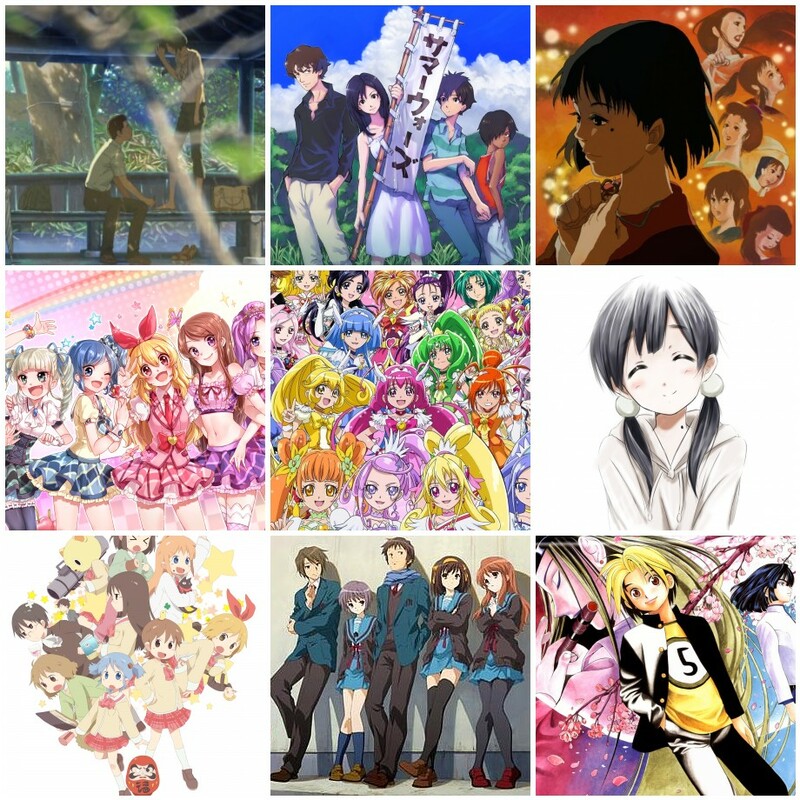 When it comes to anime, there’s the good old standby of the 3×3, the penultimate graphic in which its creator puts their entire personality and character into a single array of shows that reflect what means the most to them. Despite the guttural immediacy of twitter as a social medium, and its intense white noise of haphazardly collected and processed anime opinions, ranging from character designs to best girl to by-the-book jabs at Yamakan (it’s been two years, get over yourselves! ), even those who dwell even in the deepest echo chambers of the communities are not as soulless as their often dismissive words appear. Anime, like all fiction, moves people, resonates with them on an emotional level (processed and communicated memetically as feels), and offer marked experiences in one’s life. It is those marks left that are the basis of our identities as fans of the medium. Here, at Baka Laureate, I remain a fan of the medium, an eternally grateful one. I’ve made my share of friends, enemies, lovers, well-wishers, and even my own little readership fandom. I’ve been blogging for a few years here, on top of all the years prior about World of Warcraft and writing. In my life, it feels like I’ve only known writing. I will never truly know anime. I may not even truly know writing either, but the difference between both is that writing is something that’s proved its persistence time and again. No matter what I may be interested in during any period of my life, I will always be writing about it. I’ve since moved on to blogging about PreCure. It’s a wonderful little franchise, and I have a wonderful little blog that I’ve made for myself. I’ve even made a tumblr account just for the sake of reaching out to other PreCure fans with my writing, because that’s the whole point of what I do. I’m a fan, first and foremost. I’m not a scholar or authority for criticism, nor am I a cynic. I’m not competing to be the voice of a highly insular community. I’m not building a brand. I’m a fan. I’m a writer. I write about things of which I am a fan. And I do it constantly and without regret. It’s something that will always be a part of my personality no matter what. PreCure will still be around, and so will be my blogging about it. I’ll still be a part of the fandom. The same cannot be said about anime as a whole, however. Anime in general has been a part of me for most of my life, and will probably remain for the rest of it. I will no longer be writing about it, since there is no longer any incentive for me to write about this general thing I love. The difference between now and when I left the World of Warcraft blogosphere, is that when I left WoW, I was still looking for something. As I leave the anime blogosphere, I feel as if I’ve found it. I’ve found something that I simply love more than anime, and something that I can’t really just write about and share with people, at least, not in the same way that I have through this blog. In order to be able to have what I truly want, I’ll have to go on a bit of an adventure. It’s an adventure that requires me to leave this particular segment of the Internet, and to leave you who reads this. I assure you, dear reader, that you are not forgotten, nor will you ever be forgotten. The connection that we’ve made over the years through words exchanged remain, and even though I will be no longer around in that uncomfortable place, I will always be available for approach. It just requires a short trek outside of the anime blogosphere. If you wish to find me, you will find me. I’ll still be somewhere, trying hard to reach that future that I want. I’ve always loved book endings, and I feel I’ve successfully closed the book on this wonderful run with a fascinating community. So here it is, the end of what I feel was something quite special. Something that’s been a part of me for a long while, combined with a fondness for writing words, and simply leaving those words where anyone can see. It’s the beginning of yet another adventure, and I thank you for having been along for the ride. Ah, crap. I guess we can’t say you didn’t foreshadow this with your great twitter purge. Good luck to you, Krizz. So long, and thanks for all the fish. Good luck in whatever journeys life takes you. I’m glad you got something out of anime, writing, and our community. I have had a wonderful oppurtunity to meet you in person and I had a great time. If not for the curse of geography, I reckon we would have been really close friends in another life. Thank you for piquing my curiousity into giving Precure a try. Thank you for showing me there are people with my sense of humor out there. Thank you for standing in line with me at Anime North, when you already had your badge. Thank you for giving my writers feedback. Thank you for your ever-entertaining posts. And thank you for being something as close to a friend as possible over the long distance of the internet. Please stay in touch. Will you still be at Otakon? If so, I look forward to seeing you again. Darn, I missed your goodbye. Bye Bye Krizz. Let me know if you want to meet up at A.North. This is a very late response, I’m afraid. I found your blog a long time ago and althought I only read one excerp, I really liked reading your thoughts. I hope you can continue to write, even if the subjects change, because your voice and style are very enjoyable. Even if it’s not on a blog, perhaps you could work on a book and publish it. These are merely suggestions, of course; either way, I hope you enjoy your life and find what you are looking for. Best wishes. Baka Laureate, Create a free website or blog at WordPress.com.